Have you ever just used a product and didn't realize how much you enjoyed it's company 'til it was gone? That was how I felt with this mask. It's fun to use, offers a bit of benefit to the skin, but I just never thought to review it here on the blog. So now that I've used it up, I'd like to share with you why I kept using it and managed to finish off the whole product. This product was a gift, though I had purchased several before this one. 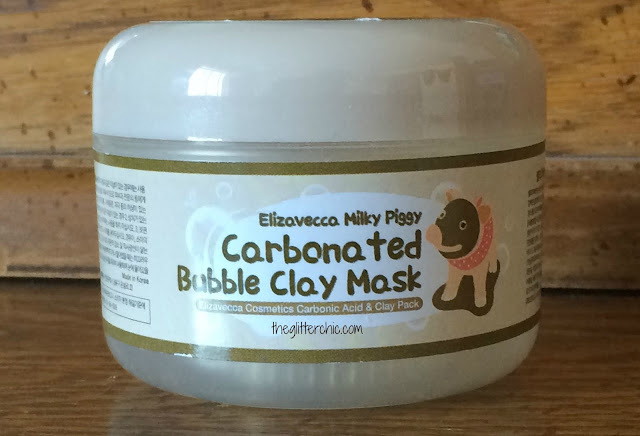 Directions: Scoop a proper amount of the Elizavecca Milky Piggy Carbonated Bubble Clay Mask and spread evenly on dry, uncleansed face. Wait for 5 minutes until bubbles start to appear then gently massage it all over the face to melt down dirt. Rinse off with lukewarm water. 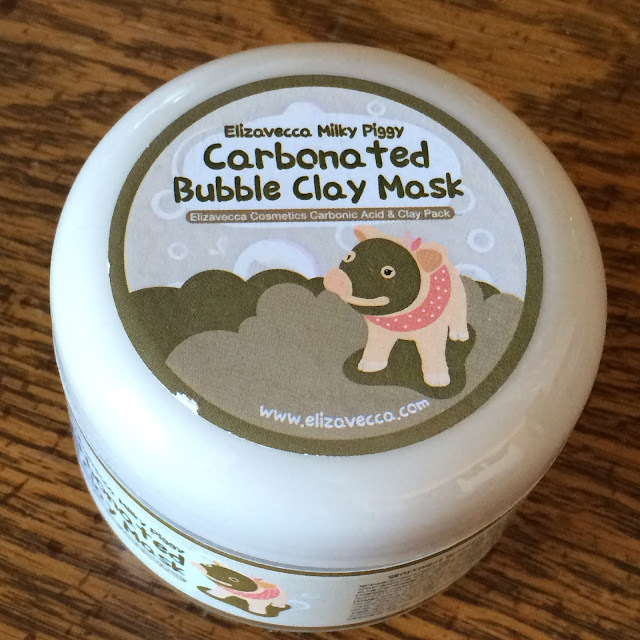 Performance: The Elizavecca Carbonated Bubble Clay Mask is like a gelatinous clay mask, that bubbles up when it comes into contact with your skin. I find it easy to spread out with my fingers, after taking a scoop out of the tub with the included spatula. It immediately starts to bubble up and tickles the skin ~ careful not to get it too close to your nostrils, or it might make you sneeze! The directions say to wait five minutes, but I usually wait 10~15, until the bubbles start to pop, then I massage it away with warm water. When washing it away, you'll notice how soapy it is - this is a reminder to be careful how much you apply, because it will take a long time to wash all the thick suds away. This mask has a lower pH of about 6, which makes it nice for those interested in using lower pH products to maintain and protect their skins' natural moisture barrier. Verdict: Overall, this is a really fun mask to use. I love how it bubbles up and I love how soft it makes my skin feel - it also doesn't make my pores appear to be much cleaner. However, I do find it drying - so this is a nice summer mask, for when my skin is very oily, but it's not so great in the winter when my skin is more on the dry side. I will continue to repurchase it for summer-time use though! Disclaimer: The Glitter Chic blog purchased/received the product(s) mentioned in this post for the purpose of review and evaluation. No monetary compensation was received for this post. The Glitter Chic blog will always provide honest opinions, beliefs or experiences on products reviewed. If you have any questions, please contact me at gothickornchic at gmail dot com. This blog contains affiliate links and I may receive a small commission if you make a purchase using one of those links. The disclosure is done in accordance with the Federal Trade Commission 10 CFR, Part 255 Guides Concerning the use of Endorsements and Testimonials in Advertising.